I’m not the kind of person who will eat a salad for dinner because it’s “light”. So when I say this one is hearty enough to be the main dish, I really mean it. Do you think it might be the 3/4 pound of bacon in it? 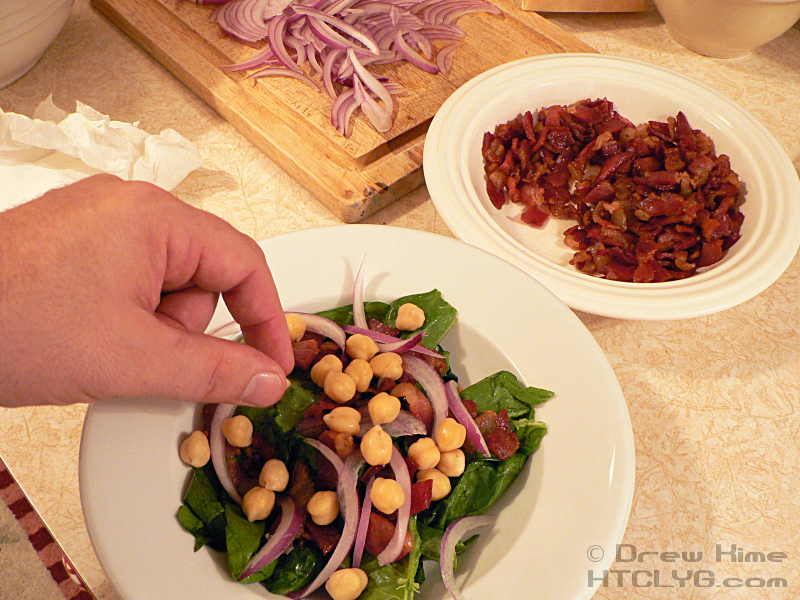 I use bacon as an ingredient more often than I eat it whole with breakfast, so I don’t need long whole pieces. 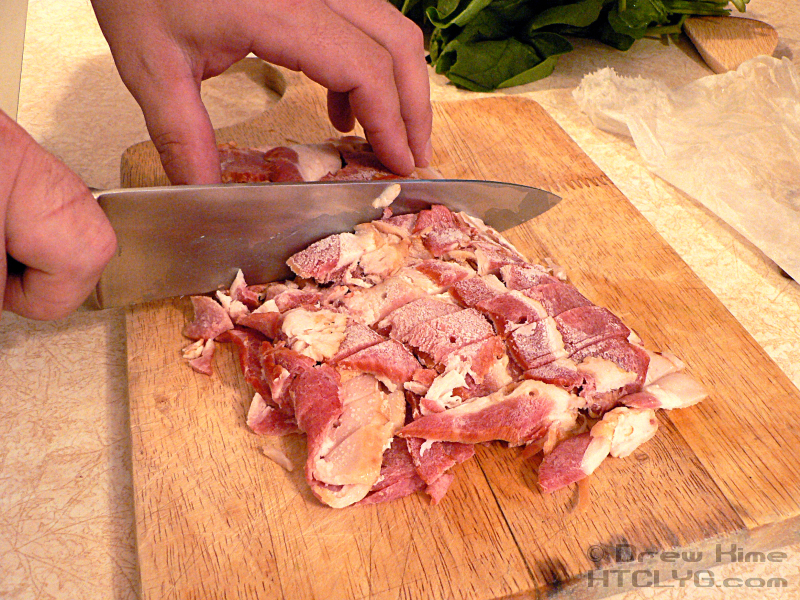 Whenever I see that the butcher has bacon ends, I take all he’s got, packed in half-pound packs, and freeze it. (The pack above is actually 3/4 pound. That’s all he had left that day.) It’s usually about a half-dollar cheaper that way, and is usually more lean, too. 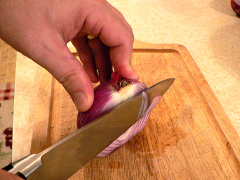 When I’m ready to cook it, slice it into bite-sized pieces while it’s still frozen. It’s way easier than thawing first, and much cleaner than trying to break it up after cooking whole slices. 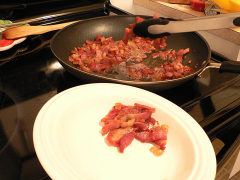 Put the chopped bacon in a non-stick pan over medium heat with a splatter screen over it, and stir it occasionally while you prep the rest of the ingredients. 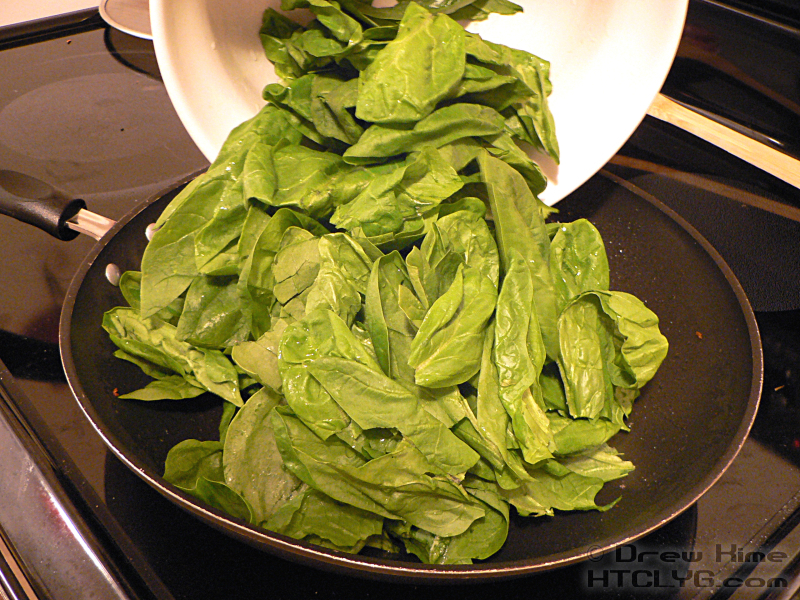 The bunch spinach I got had more stem left on it than the ready-to-eat bags, which cost twice as much. The only prep you need to do is pull off the stems and rinse it, which I do with the bagged spinach anyway. 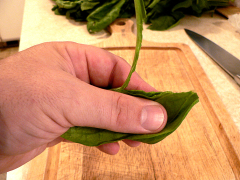 Fold the leaf in half lengthwise, with the back of the stem on the outside of the fold, the pull the stem off up to halfway up the leaf. 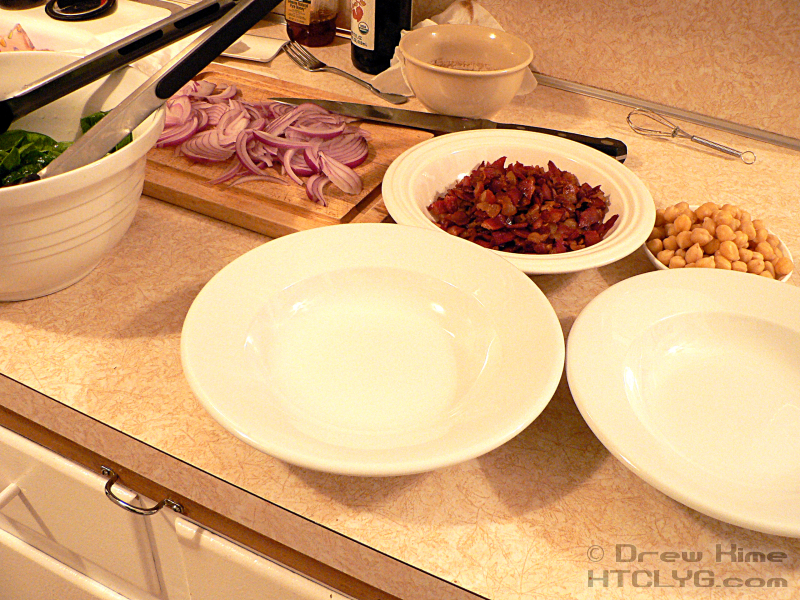 Prep about twice as much as it looks like you’ll want. It loses a lot of volume when you wilt it. Since we’re using red onion — as much for the color as the flavor — we want to go with really thin shreds. 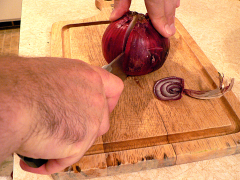 Cut off the stem end, split the onion in half, and peel off the papery outer layer. 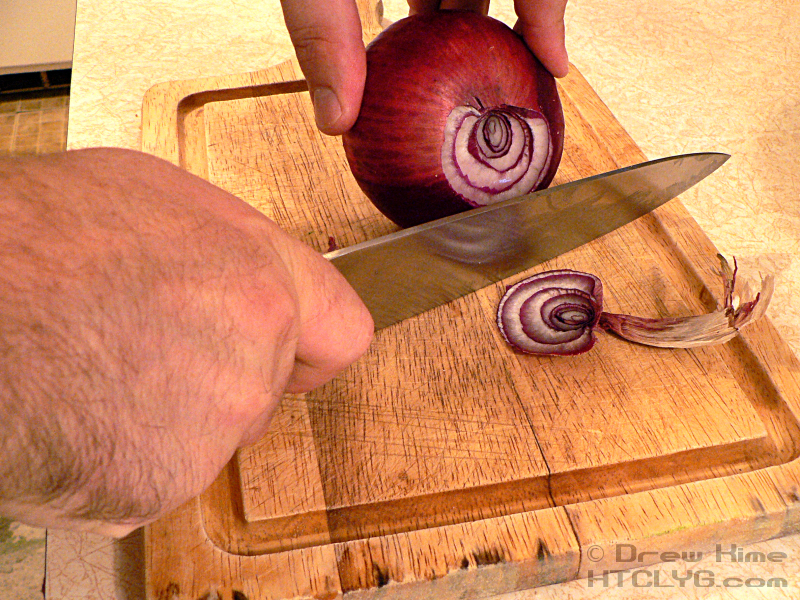 Stand the onion on the cut end, and shave the thinnest slices you can vertically. 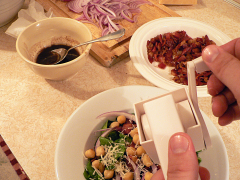 This will give you nicely curved pieces. If you’ve got canned garbanzo beans, drain and rinse them. If you’ve got fresh … well, you’re already several hours behind at this point. That’s how long it takes to soak them. I’ll cover that tomorrow for those who like buying in bulk. By now your bacon should be done. 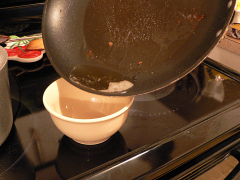 Remove it from the pan with tongs or a slotted spoon, leaving as much of the fat in the pan as possible. Pour the fat out into a bowl and make the bacon balsamic dressing. 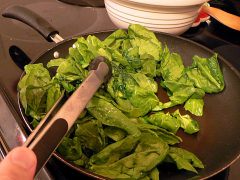 Don’t scrape out the pan, you want to leave just a little fat for wilting the spinach. Return the pan to low heat and toss in the spinach. Turn it with the tongs several times to make sure all of it hits the hot pan briefly. 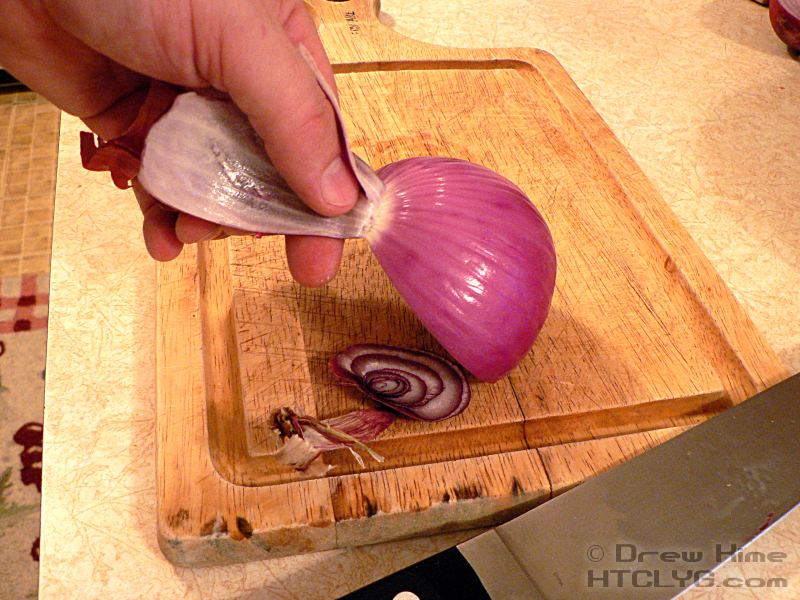 You’re not trying to cook it down, just wilt it a little bit. The color should change from bright to dark green, but the leaves shouldn’t get floppy. Return the spinach to the bowl and set up a prep area with all the ingredients. 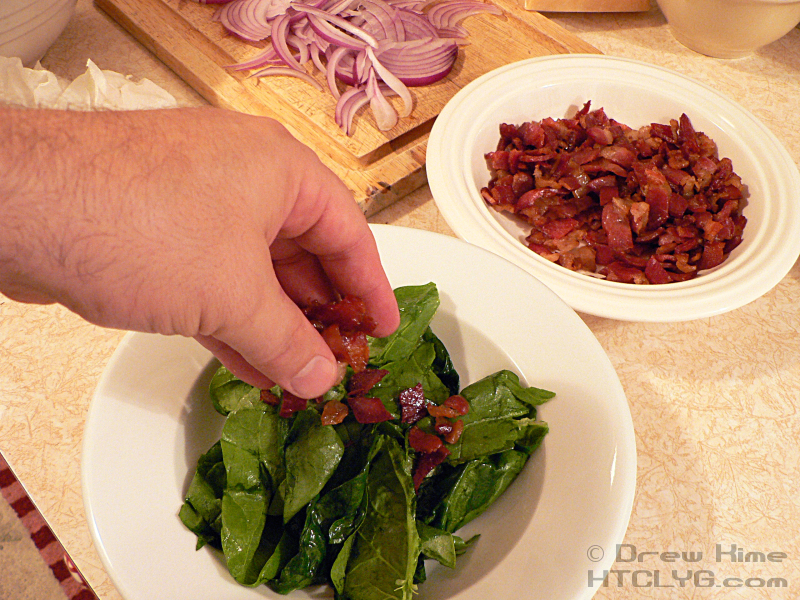 On a bed of spinach, add the bacon and onions. 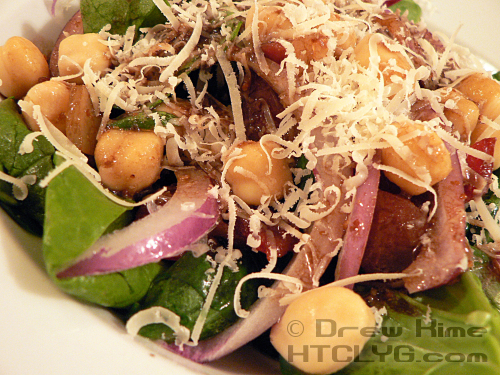 Then the garbanzo beans, and freshly grated Parmesan. 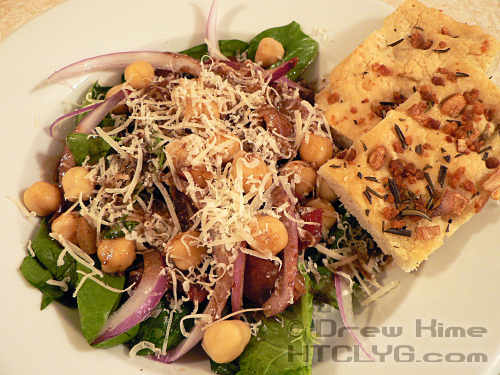 Serve with fresh baked focaccia. Maybe add some more Parmesan. And even more bacon. 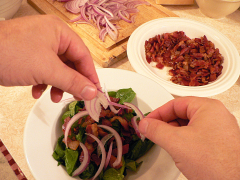 Because — say it with me, kids — “Everything’s better with bacon.” That’s right. Come back tomorrow to see how to soak bulk garbanzo beans. The flavor is much nuttier, and the texture is less mushy than canned. I’m not completely sure it’s worth the extra effort, but I’ve still got half a bag to go through, so I guess I’ll be getting a lot of practice. 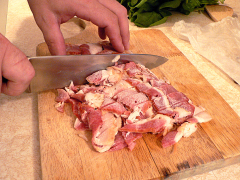 Chop the bacon into bite-size pieces, about an inch. 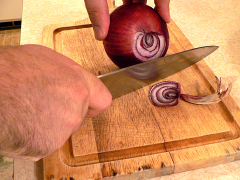 (It's easier to cut if it's still almost frozen. Cook in a non-stick pan until slightly crispy. Lift out the bacon and pour the fat out into a bowl. 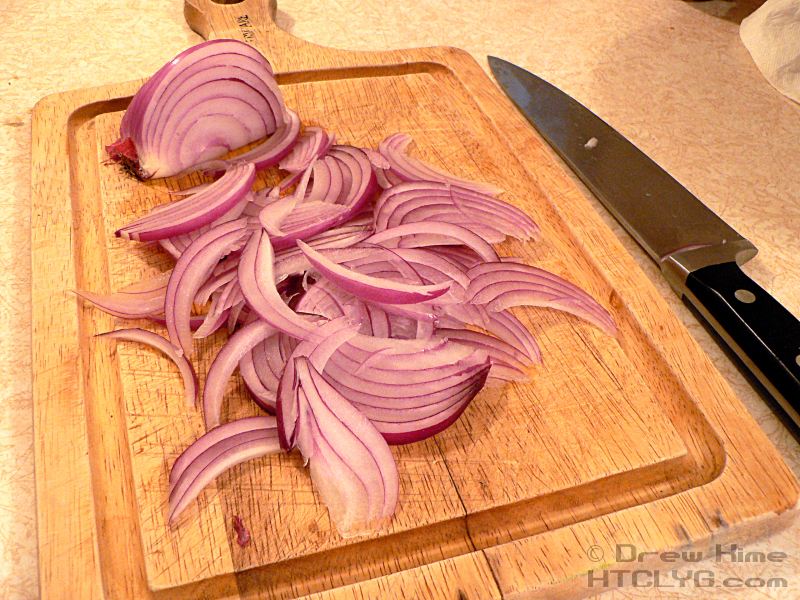 Leave a tablespoon or two in the pan. Wash and stem the spinach. Put it in the pan with the bacon fat over medium heat. Toss until the color changes from bright to dark green and it is slightly wilted. 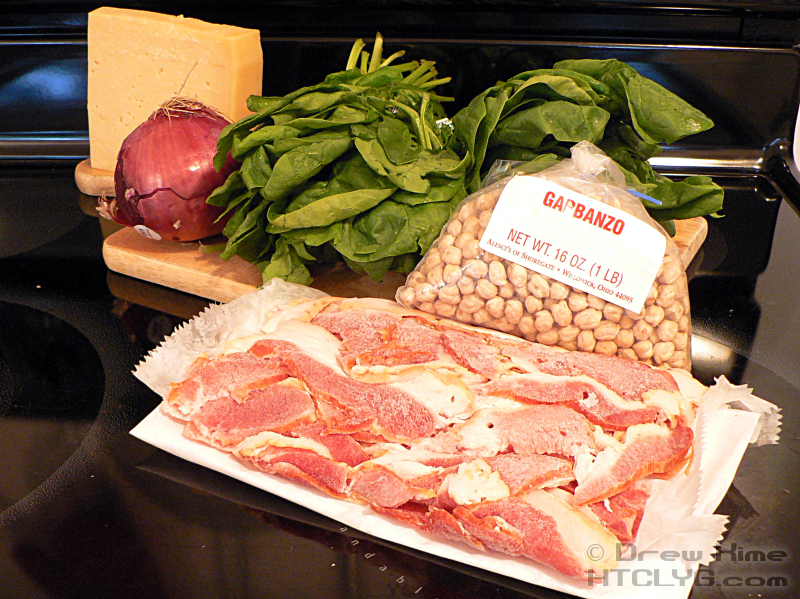 Plate the spinach with the onion, garbanzo beans and bacon. 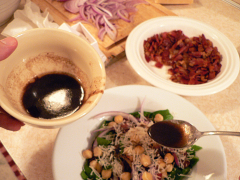 Mix together the reserved bacon fat with the other dressing ingredients. 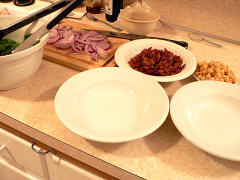 Start with ½ cup vinegar and adjust to taste. 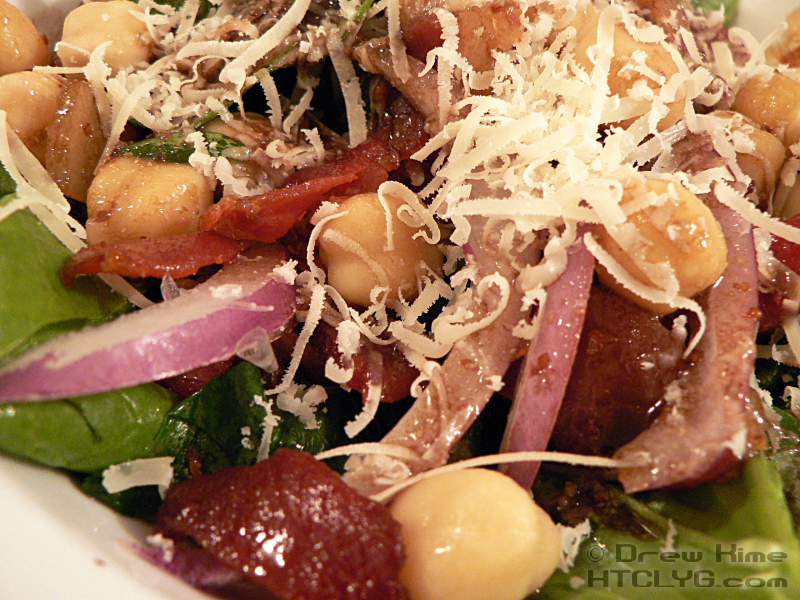 Dress the salad and top with cheese.